Growing up in Boston I learned a few things, one of which is space is a luxury! So we must make sure we take advantage of every square inch. 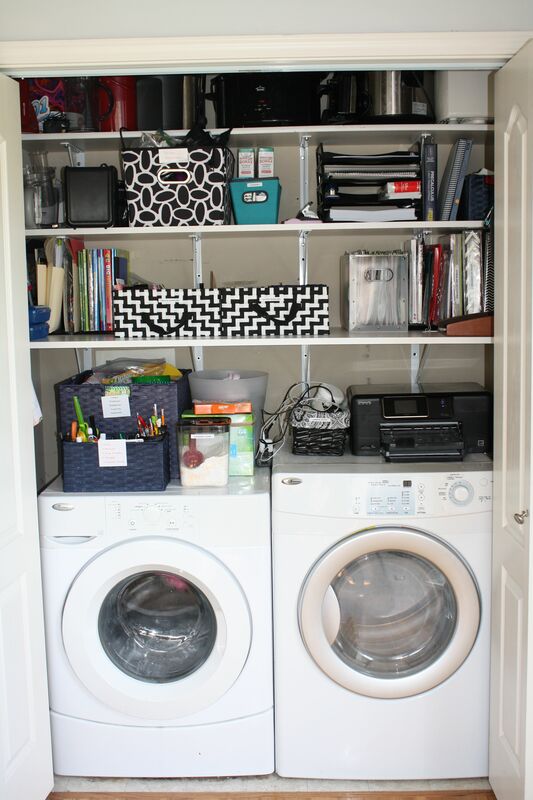 If you have a small space, compact or 24 inch laundry is a good option, but you will lose almost 50% of the capacity. Contrary to public opinion, you do have full size options. What makes a full size more adaptable in tight spaces? Well first they must be able to stack the dryer on the washer. Most front laundry load laundry can be stacked unlike in years past. The more options we have to vent the unit (left right up down or straight back) allow the appliances to be used in more locations. Finally depth, no one wants appliances sticking out of a closet.  We will look at three popular sets, but first let me show you a popular product to avoid if possible. Whirlpool has been very successful over the years selling this product especially to builders. This set is only 24 inches wide, but the capacity is 1.5 cubic feet minus the size of the agitator. You cannot fit much in this unit. For smaller units, look at compact washers with 2 cubic capacity and no agitator. For full size, you should look at these three sets: first is the Electrolux 617 model, second is the Maytag MHW5500FW and finally the Speed Queen AFNE9BSP113TW01. Electrolux is a great option if you have a little more depth. At 32” deep, it is not the shallowest by any means but it does have an ace in the hole with its design. It can allow for the vent to go in any direction but up without adding depth. Some other great features to this pair are the reversible doors. Most doors can only be reversed on the dryer. Electrolux is the only one who can also swap the washer so if you’re in a space that requires both doors to open the same way. Finally, it’s an excellent set in terms of washing and drying. Electrolux has a 3 pump system in the washer. The cycle is faster at 15 minutes with a more even distribution of detergent on your clothes. The fresh water cycle at the end insures no additional soap residue will be on your clothes! 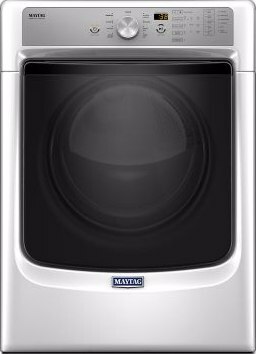 Maytag has been a division of Whirlpool for over 10 years. It is a great choice for small spaces. You can stack the dryer on the washer, and it can be vented out of the back and both sides. Another very large machine with capacity and the big feature is power wash. This is a great cycle for stain removals. Speed Queen is an all American company built in Wisconsin. The company was founded in 1908. Originally they only produced laundry units for commercial use. If you have ever stayed at a hotel or used a laundromat, you have had your clothes washed by Speed Queen units. Their reliability is reminiscent of the old days when machines where built to last, using all metal parts. Speed Queen has a 5 year warranty as well. Space wise, they will be the most shallow full size units available at 27 3/4”. A bit higher in price then the other 2 machines but if space is really a big issue, consider Speed Queen. So between these 3 pairs which one is best? Well, all have unique features which means it is the best choice for your space. 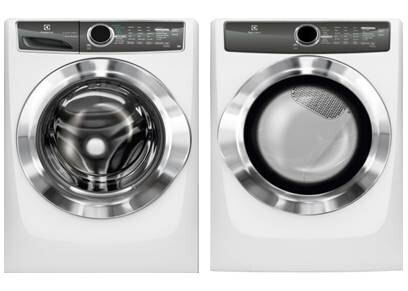 Electrolux has the 3 pump system leading to a faster, more thorough washer and dry along with a 15 minute wash and dry cycle. You can also change the side of the washer and dryer so there is more flexibility in where this machine can fit. 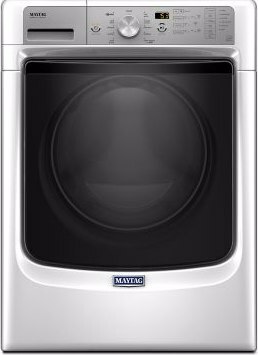 Maytag, like Electrolux, has similar dimensions and also has the power wash for those extra tough stains. If you have kids who play sports or just in the mud this is a great feature so you’re not hand scrubbing their clothes for hours. Both can be vented through the sides. Finally, Speed Queen is the old reliable with all metal parts, an all inclusive 5 year warranty and the shallowest depth so it can accommodate those very tight spots. Laundry has become the second most challenging appliance to deliver after refrigerators. If you are bringing this upstairs, you should measure all the points of entry. You need water and power, but planning the vent becomes crucial beforehand. Now lets just say you cannot accommodate any full size laundry. Look at compact laundry like Bosch, Miele, Electrolux or Samsung. They are much easier to install and many are vent less condenser drying. Have more questions about laundry? 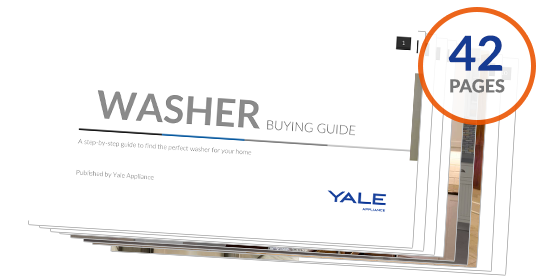 Get the Yale Washer Buying Guide with features, specs and capacities of all the major brands. Well over 200,000 people have read a Yale Guide.